Today researchers from a number of universities, including the University of Houston, and the Environmental Defense Fund (EDF), published eleven studies in the journal Environmental Science and Technology, which evaluated methane emissions from oil and gas production in Texas’ Barnett Shale region. The findings show that methane emissions are manageable, and in the overwhelming majority of cases, leakage rates are exceedingly low. The reports underscore why the IPCC and many other scientists have said that natural gas provides enormous environmental advantages. In the few cases where researchers found higher emissions, these were well-defined as outliers – the exception rather than the rule. In other words, the studies paint a very positive picture of how the industry is continually reducing methane emissions to produce a resource that brings so many environmental and economic benefits. Many scientists have observed that, for natural gas to maintain its climate advantages, methane leaks need to be kept between 2 to 3 percent. EDF has long maintained that natural gas is beneficial for the climate “as long as leakage remains under 3.2%.” With an average leakage rate of 1.2 percent, the data clearly show a leakage rate well below that threshold. These new studies follow a number of other key reports that have found low methane emission leakage rates. Most importantly, the U.S. Environmental Protection Agency (EPA) latest Greenhouse Gas Inventory found a dramatic decline in methane emissions from natural gas production in recent years. According to the EPA, methane emissions from natural gas production have fallen 38 percent since 2005. Over the same period, U.S. natural gas production has increased by 26 percent. 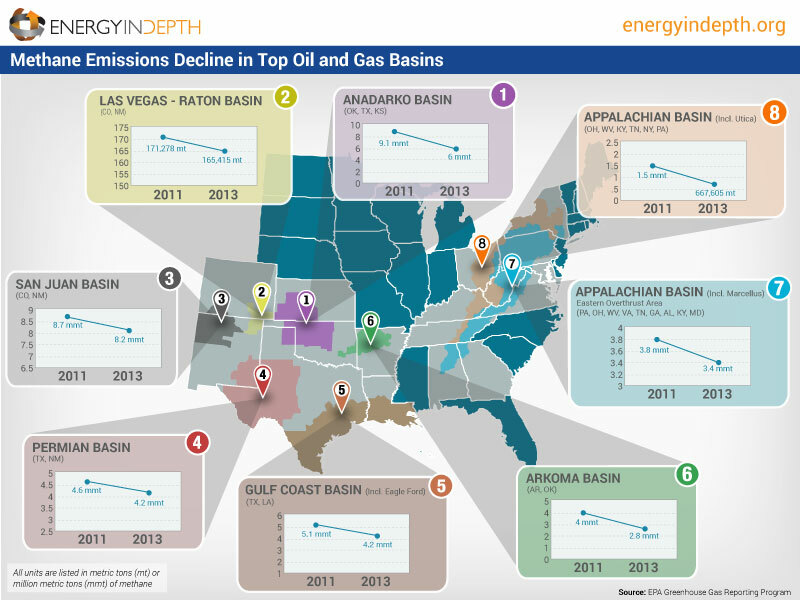 Earlier this year, researchers from the University of Colorado at Boulder and the National Oceanic and Atmospheric Administration (NOAA) released a report, which found that methane leakage rates from three major shale developing regions – the Haynesville shale region in Texas/northwestern Louisiana, the Fayetteville shale region in Arkansas, and the northeastern Pennsylvania portion of the Marcellus shale – are in line with EPA’s leakage estimate of 1.1 percent of production. Importantly, the areas of study collectively represent over half of the United States’ total shale gas production. 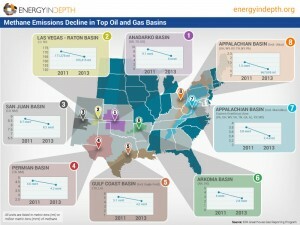 EDF’s previous studies, done in conjunction with the University of Texas, also found very low methane leakage rates. These studies concluded that methane emissions from the upstream portion of the supply chain are only 0.38 percent of production. That’s about 10 percent lower than what the same research team found in a study released in September 2013. Reports from MIT, the University of Maryland, multiple reports from the U.S. Department of Energy, Carnegie Mellon and even Cornell University have found methane leakage rates that are low – and far below what activists have claimed. “Emissions from natural gas production sites are characterized by skewed distributions, where a small percentage of sites – commonly labeled super-emitters – account for the majority of emissions” (p. 8167; emphasis added). A release from the University of Houston further noted that a “few individual sites” had high methane loss rates. They further noted a leakage range of 0.01 percent to 47.8 percent, although the median leakage – 2.1 percent – indicates “the vast majority [were] on the lower end” of the scale, according to the Texas Tribune. “In total, 70% of well pads had emission rates less than 5 kg/h,” according to one of the reports. Yet even with making a point of seeking out “higher” emitting well pads, the researchers still found a low leakage rate overall. The problem with that approach is that the researchers are taking EPA’s methane data for the entire country and prorating them in terms of how many compressor stations, processing facilities, wells, and other equipment are in the Barnett Shale. To put it another way, they’re using national data to estimate what the data would be for the Barnett Shale, then comparing their “top-down” measurements against their own assumptions. EDF has long contended that it’s not appropriate to argue that methane emissions in different shale producing areas are uniform, due to the presence of “super-emitters.” Indeed, that’s what many of today’s studies also suggest. Yet by prorating national data, and assuming emissions rates for the entire nation are indicative of the Barnett Shale specifically, that’s exactly what the researchers themselves are doing. It’s possible that Barnett emissions rates are higher or lower than what the researchers assumed, which could have a significant impact on whether they can claim their data show leakage rates “50 percent higher” than EPA. The University of Colorado at Boulder and the National Oceanic and Atmospheric Administration (NOAA) report, mentioned above, also used “top-down” measurements in some of the top producing shale producing regions across the country and found very low leakage rates: in the Haynesville Shale in Louisiana and Texas the researchers found leakage rates of 1.0 to 2.1 percent; in the Fayetteville Shale in Arkansas the rate was 1.0 to 2.8 percent; and the Marcellus Shale it was 0.18 to 0.41 percent. These latest studies show the Barnett Shale has a comparably low leakage rate of 1.2 percent.